The continent Ageron is actually fairly old, created by earth mages via the recently rediscovered Mountain spell and spread out over time. The island itself has a population of over 200,000, but attempted to remain uncharted for as long as it could, due to the power and terror of stories told about adventurers on the outside islands. Having remained rather peaceful, the island(s) actually ceased to exist for about 30 years. Reasons for this are unknown, but it has returned, causing nothing more than a small tidal wave upon re arrival. Signs point to a massive psionic malfunction in the city of Uzumi playing with time magics. The island itself consists of several large landpoints and cities, which are described below. 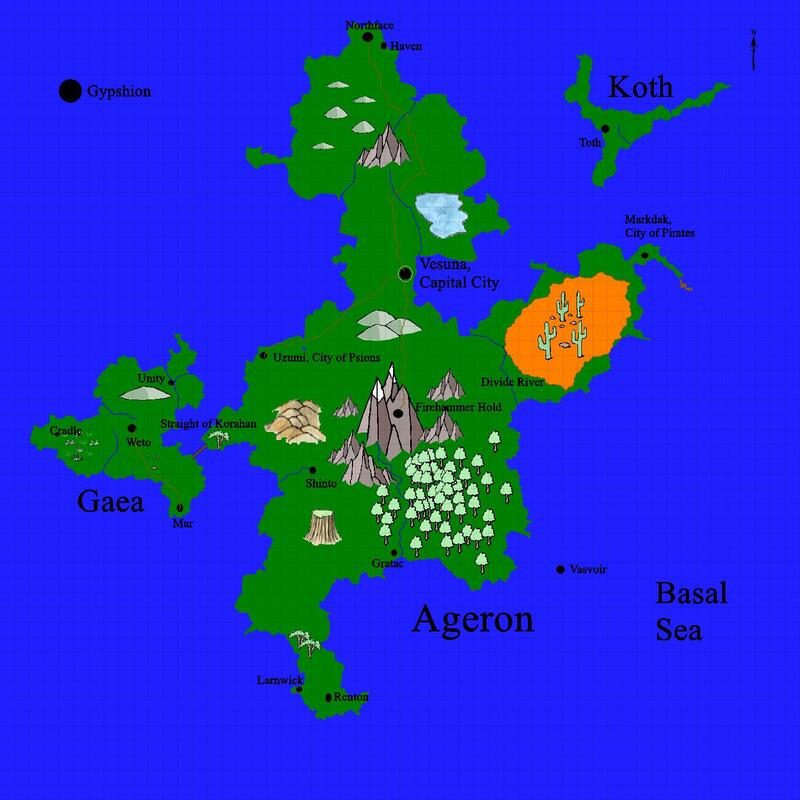 The island of Ageron is 270 miles long, by 140 miles wide. Vesuna The capital city. Its population is nearing 125,000 123,000 people, the majority of which are humans, lizards, and elves. The current reigning King's name is Nicol Bowarn, and has been reigning since his ascension to the throne at age 35. He is a proficient mage and alchemist and would rather spend his time tinkering away than deliberating politics. Rumor has it he has found the elixir for immortality, but this is not backed up by any basis. The rest of the city survives well on farming, minor mage work, and trade with Firehammer Hold for iron and other like goods. While this is the capital, unless necessary the majority of the power is delegated to the mayors of each other town, and they take a more passive stance on most political issues. It has been seen though, that if the system needs a fix, Nicol will not hesitate to help the people. Northface Pop: 32,000. A fairly large city located at the north end of Ageron. Located on and in a cliffside, it is continuously windy, which has led to windmills and primitive forms of electricity and lighting being used for power. This city is host to a large university. It is also currently being plagued by an incurable disease. Renton Town of population 4780, Claire has plans for this. Larnwick Town of population 5776 Claire has plans for this. This town is on the western tip of the southern peninsula. Divide River: This river connects from both sides of the ocean, and twice a day with the tides switches flow direction. Beyond it, there is one massive desert, named Kroan. Kroan: A massive desert inhabited by six tribes. The only permanent city within it is Tephis. Temperatures can reach upwards of 120* F here. Tephis: Pop 45,000. A booming city of trade and entertainment within the bounds of Kroan, which originated as a meeting place for the tribes of the region. Koth (Island) This island is fairly thin, meaning exploration has been quick. It's swampy, wet, and corrupted by a strange, dark magic, making it highly inhospitable for most life forms. The one city is Toth, which is described below. Toth, City of Necromancers: Pop 15,000. While by no means is everyone here a necromancer, this place has been the thorn in the side of the kingdom. The city is ruled by a handful of powerful families who are constantly scheming to attack and weaken each other, meaning that the city never focuses its attention on expanding outwards. Weto Weto is currently a town that is comprised of farmers, miners, and hunter gatherers. Unity Previously a city that was located on a different plain altogether, the city itself was transported to Ageron after the time hop event had ended and Ageron was already back. The city is a haven for species that don't feel welcome in normal life, and refugees from adventurer-infested/destroyed plains. Cradle City is vastly unexplored, and cannot be found without being guided there by the natives. Southern Forest of Ageron: Somewhere inside, there is said to be a lost elven city in the treetops, but to this day nobody has seen any evidence of it. The forest ends near Firehammer Hold, and goes west to the largest river of the continent. Qiryah Amir: Pop 8,000. An ancient city within the Forests of Ageron. It has only recently revealed itself to the world. Gratac: Rumor has it that even none of the Grand Masters (GMs) know what this city is. Vasvoir, (Aquatic city):Vasvoir Population 13700 This city, comprised primarily of lizards, is located on the bottom of the basal sea near the shore of Argeon. The city of Vasvoir is completely submerge except for a dock in the middle of the water that houses an elevator to the city. While friendly and open to outsiders, a large majority of the city is inhospitable to non-waterbreathing creatures. However the city proper is in a sealed dome to allow commerce and interactions with outsiders. Since this city had no land to grow crops it relies on other mainland cities for produce, trading it's abundance of deep ocean fish and corals. Gypshion Population: 1390 Settled on the massive levitating chunks of earth north of Vesuna, this city is as mysterious as the levitating rocks themselves. Little is known about this small city given its location and secluded populace. Inhabited mostly by nomads, this city is a place of boisterous festivities and lively carnivals. Once every decade the city hosts a grand event filled with mysterious magic and wonders; it is only held when the sun has set and is so named, The Night Circus. Little is known about this event since talking about it in anything other than vague details is impossible once the circus has concluded. Fadencrest Population: 750 Population 750ish and located in a mountain valley southwest of Firehammer, originally a closed door religious convent of the followers of Emizzair (Em for short) that is now a small trading town. The town boasts the Exotic business league, a moderately productive renovated iron mine, and a Tor’ite barracks as well as the original temple to Em. While all major faiths deny that em exists and no proof of his presence is apparent, the followers still worship avidly. The region around Fadenwood is known for its meteor showers and the strange metallic ore that lands there.